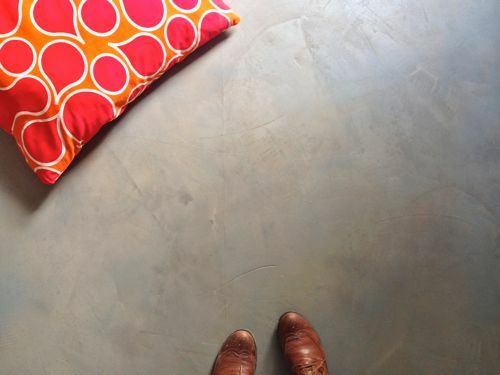 I’m pleased as punch to tell you about the DIY concrete floor experiment that we tried in the reading loft of The Treehouse. I love how it turned out! The texture is wonderful. 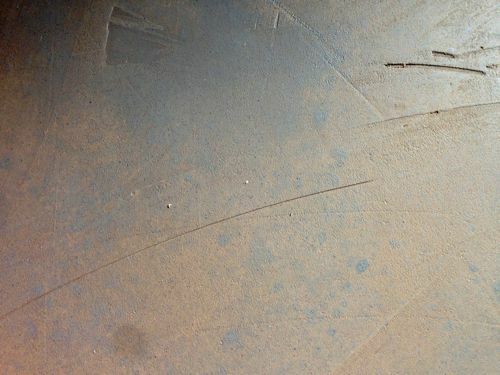 The floor looks layered and feels like it has depth — but the whole surface is barely 1/8″ deep! It’s easy to clean and maintain. It has the industrial look I am every drawn to. Plus, it was inexpensive and totally DIY-doable. I originally thought we would put carpet in the loft, but then I changed my mind and thought I would rather install a sweepable surface with an area rug on top. I made some inquiries about concrete floors and was told the weight of true concrete would be too heavy for this area, so I shifted my attention to tiles. 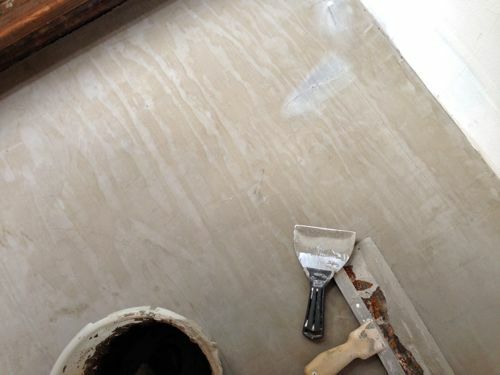 But about that time, I read a blog post about resurfacing a laundry room counter with a thin layer of concrete and I wondered if I could try the same method on the reading loft floor to achieve a concrete look without the heavy weight. I finally concluded: why not try? The space is small and a low-traffic area. The materials are a bargain, so if it failed it wasn’t too great of a loss. Plus, if our DIY concrete floor was a disaster, I could cover it with tile or hardwood and hide the evidence. So I gathered the materials and went for it! 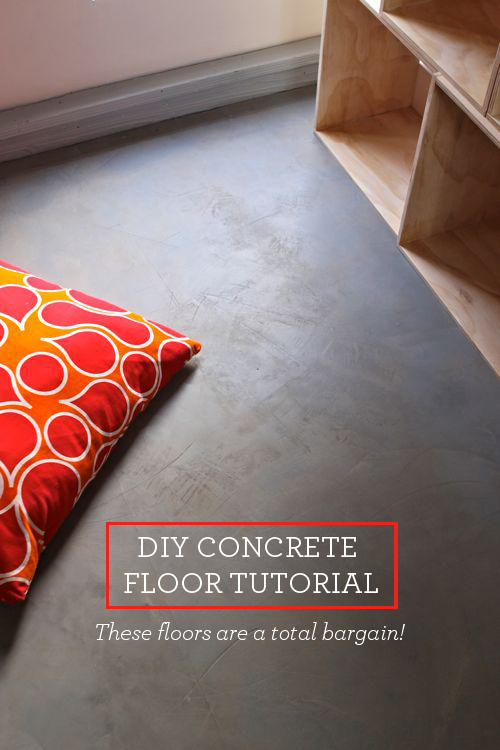 Would you like to see how this DIY concrete floor came together? Let’s start with a few before shots. 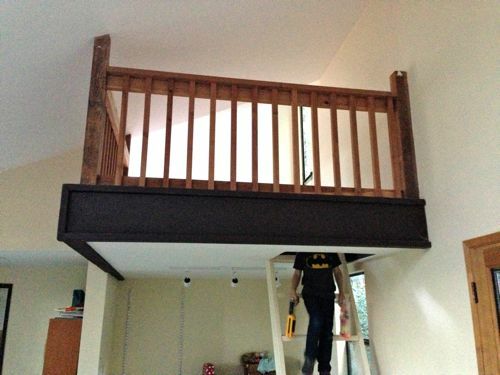 As you can see, the loft is a small raised area above the family room. The whole area is about 7 x 10 feet, and can be accessed by a ladder. The floor was unfinished — a simple plywood subfloor ready for carpet, tile, hardwood, or in our case: concrete! Next, let’s talk materials. The magic ingredient is Ardex Feather Finish. This stuff is simply a delight to work with! You can apply it in thin, thin, layers and then build it up to a beautiful finish. It used to be hard to find, but now it’s available online! You’ll also need a trowel or spreader — I liked using a couple of different sizes — plus an old bucket and spoon for mixing the Feather Finish. Once I had the appropriate supplies, I reviewed directions for a DIY concrete floor found here and here. 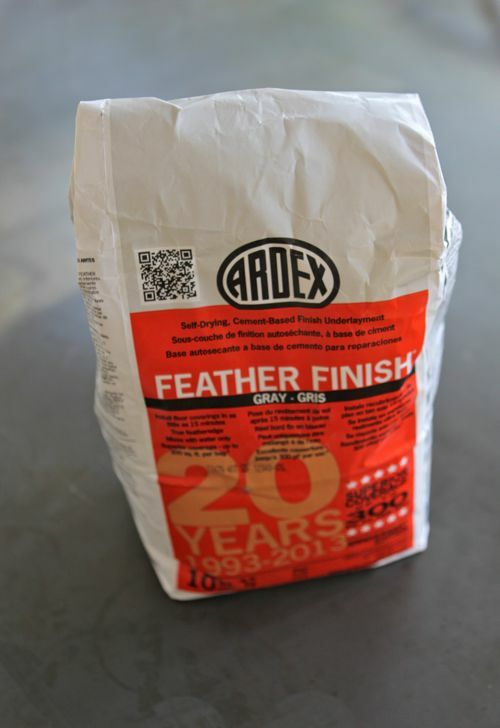 Essentially, you pour some Ardex Feather Finish (it’s a powder) into your bucket and add some water, then stir. You’re going for the texture of a thin pancake batter. I never measured the Feather Finish or the water. I would just add a little of each till the texture was right. I also worked in small batches — because this stuff dries really fast! I worked in very thin layers for our DIY concrete floor. In fact, I could see the plywood through the concrete for the first few layers. I was working on this late at night, so I would do a layer, then head to bed and then let it dry over night. Which means the project dragged out for days! But the layers actually dry quite quickly, so you could truly tackle this on Saturday and finish the whole thing. Before I added each new layer, I would take a putty knife and scrape off any bits of dried concrete that were protruding too much, and I would give the entire floor a very light sanding. Then I would sweep up the dust and add another layer of Feather Finish. Ultimately, I built up 6 thin layers and then topped it with a thicker layer. 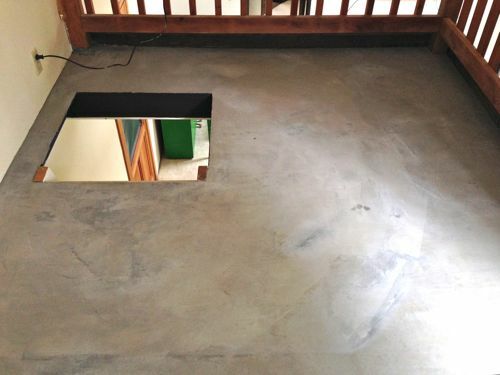 But the whole DIY concrete floor is quite thin — maybe 1/8″ thick max. One thing I learned: You can still see the seams of the subfloor (notice the vertical line on the right hand side of the photo above). In the case of the loft floor, having seams showing is fine with me because I knew it was an experiment and I had low expectations — plus, I’ll be adding an area rug which will cover the major seam anyway. At this point, I departed from the tutorials I linked to above and tried concrete stain, instead of the recommended sealant. This was a tip from sculptor who has worked with concrete before and knew this would add depth. And it totally did. The stain definitely created depth and also left bluish areas that look really cool! I really like how the stain affected the overall look. 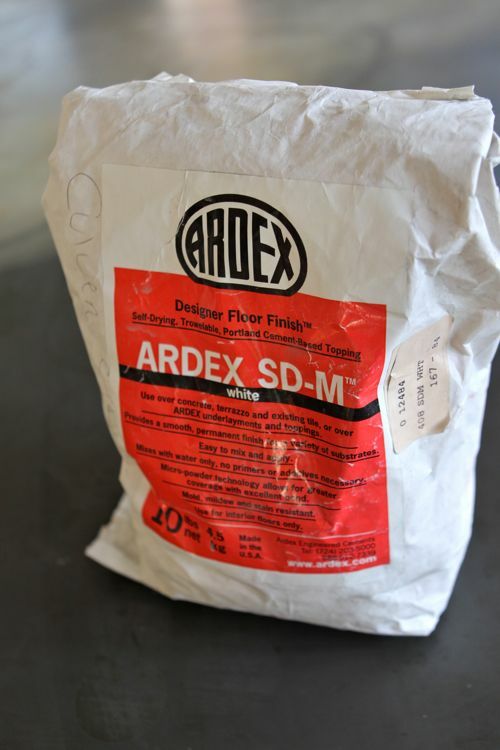 One other thing I learned: In addition to the Ardex Feather Finish, I also bought a bag of Ardex SD-M. The Feather Finish only comes in gray, but the SD-M comes in either gray or white. I chose white. I’d read that you can add a layer of SD-M on top of the Feather Finish if you want a whitish floor instead of a gray one — and that you can even tint or dye the SD-M if you want colored concrete. 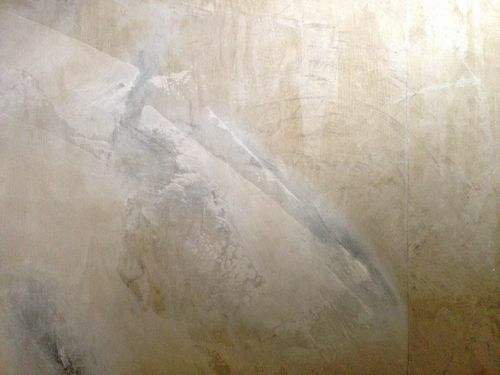 Since the floors downstairs were white-washed, I thought it might cool to keep the concrete white as well. So for layer number 5, I used SD-M instead of Feather Finish. Turns out, I didn’t like the look of the white at all! I much preferred the gray. And it might have been my imagination, but I felt like the SD-M wasn’t as easy to work with as the Feather Finish. Anyway, for layer 6, plus the finish layer, I went back to using Feather Finish. And that’s it. Pretty darn easy. Plus economical too! A bag of Feather Finish costs about $15 (in our case, the loft needed one full bag), and then you’ll need some concrete stain. 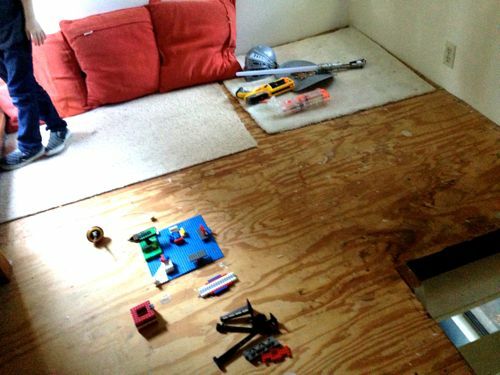 A whole new floor for about $30 in materials! The reading loft is really coming together. One last note: as I mentioned above, the reading loft is low-traffic area. The concrete is doing great, but I really have no idea how this would hold up in a hallway or kitchen. That said, I think we might try it in another space — possibly the boys bedroom, or even the family room! If we do, I’ll be sure to share anything new we learn. I’d love to hear what you think about our DIY concrete floor! 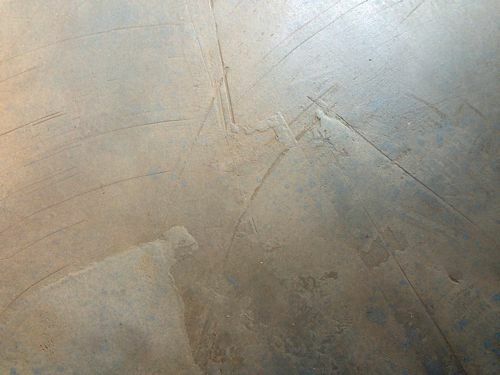 Do you like the look of concrete floors or are they too industrial feeling for you? And would you ever try this sort of project/experiment yourself? Or do you prefer to stick to more proven methods? Credits: Photos and text by Gabrielle Blair. Love how this turned out and fascinated by the process! I’ve always liked the look of concrete floors and I love industrial elements — so long as as space is still warm. An area rug is a great way to do that. I really like the stain you used — it really added something special. Would love to hear how it holds up if you do this in another room. I’ll be sure to report! I’m thinking of doing this floor. I was wondering how, several years later, this held up?? I fully agree, Emme — concrete definitely doesn’t lend itself to plopping down! I think that’s why my initial instinct was wall to wall carpet for the loft. But ultimately, I’ve found I have an easier time keeping hard surfaces clean (like wood or concrete or tile), and then softening the spaces with area rugs. In these photos, I’m showing the concrete bare so you can see more of it, but when I show the finished reading nook, the floor will have an area rug, plus floor cushions. So hopefully it will be cozy and inviting — and easy to clean too! I’m so intrigued by it, too! I’ve never tried it, but the process was described to me as stapling down a single layer of burlap over the entire subfloor surface — making it as flat as possible. Then, you apply the concrete mixture directly on the burlap. If you’re doing thin layers, I’m guessing it will take a few layers to build up until the burlap is completely covered. Or perhaps you just start with a thicker layer and then go thin from there. If I try it, I’ll certainly let you know! While I like the look are you not worried about having a hard floor like that and your kids falling over and hurting themselves? I was a pretty clumsy kid and I can’t count the amount of times carpet saved me from serious injuries. In a similar way the “soft” tarmac in childrens playgrounds once saved me from breaking my neck and I only got a concussion. Or is that where the rug will come in? I avoid rugs as I usually slip over on them, maybe I’m a clumsy adult too Ha! Hi Katie. Good question. In the loft, the space is so small, that the kids can’t really do much of anything rambunctious, so I haven’t worried about them getting hurt on the floors (I’m more concerned about them falling down the ladder!). 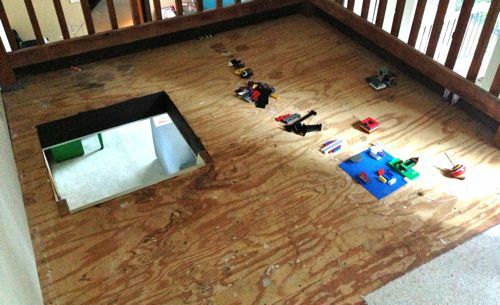 My experience with hard floors (we lived with many in France) is that they worked out really well for the kids. They’re easy to maintain and you can soften the room with area rugs. I really like the flexibility of area rugs — they appeal to the designer in me who likes to switch things up and try new layouts and color schemes in a room. And they’re easily replaceable if some kind of crazy damage or flooding occurs. But I know others really love the comfort of wall to wall carpet. I’m betting it’s one of those personal preference things. I love this! I really like the look of concrete floors, I like them even more now that I know it can be done cheap. Thank you! Jenny’s a good friend of mine and I linked to her twice in the post — or at least I thought I did. Did I forget one? Or maybe the links aren’t working for you? I’ll go double check. Thanks for the heads up! looks great! would love to play with color and concrete. the small space is perfect for concrete. looking forward to the reveal. I have wanted to do this ever since I found out about the Feather Finish product. It was originally developed for flooring. Please, report on how it wears, cracks, etc. Can you put it over a concrete slab? 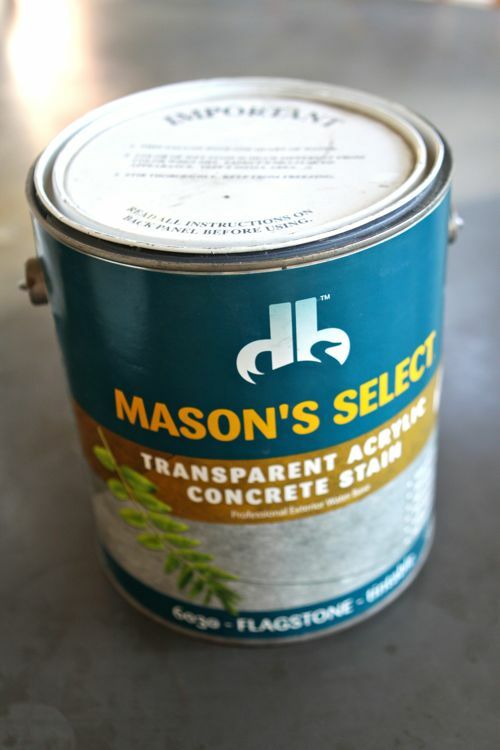 From what I’ve read, Feather Finish is ideal to top off a concrete slab. If you try it, I hope you’ll let us know! We hope to go non-profit soon and take this program to schools across the country. Wow ! That floor looks great ! I worked with concrete before but never used concrete stain. I love that look. Will try it out with my next concrete project. Thank you for sharing. Great post! I’m surprised nobody’s asked yet, but where did you get that awesome pillow? Looks really great, seems like it was fun to do also. I never would have thought of that finish in a space like that. Keeping it clean is going to be easier than lugging a vacuum up ! Love the look of the stain. Looking forward to seeing the finished space. What a great solution. I can’t wait to see the finished product. I’m actually very hopeful. Everything I’ve read about Feather Finish says it’s wonderful for this type of application. I guess we’ll see! I really like how this came out! And what a budget-friendly project. I’m interested to see how it holds up – please keep us posted! Yes! My mind is already churning! You always have great ideas that sound so challenging; how do you make it look so easy? I am really curious as to whether the concrete will crack. My other thought was- can the kids use chalk to draw on this? Looking forward to seeing your nook when it is all decorated/furnished. On ours, there is a slight crack along the plywood seams, but we were expecting that. Otherwise, no cracks at all so far. I love the look with all of the swirls and patterns from the tools you used. Great job! Just a quick question about your chili recipe (sorry to include it here… wasn’t sure if you would check back on the chili comments this many days after). I made your recipe with a crockpot on low; it started almost 4 hours ago. You don’t say to stir and I followed your directions literally. The 2 spoonfuls of cream cheese are still on the top of the mixture. Is this normal? Should I have stirred everything before I closed the lid? I know you don’t make it with a crock pot… It does smell great! Hi Amy! Yes, definitely stir it up. Do you think this would work in a small bathroom/laundry area? I imagine it would, but it probably depends on how much traffic the area gets. Our floor has been in for a a few weeks now and still looks great — but that’s not enough time to really test. love how this turned out. will definitely keep it in mind for some floors in my future house. i adore the stain. great job. That’s nice! Just like the ferry building floor! Sometimes it cracks, not sure how would you avoid this? Fantastic job ! This looks so great! I would love to do this in the old part of our basement! It looks just like the industrial floors in cool shops that I love! Thanks for sharing this tutorial! where did you end up getting (or making) your wood crate shelves? I love the look! Thanks. Hi Anna! I love them too. We ended up having them made/making them ourselves. I’ll be sharing a tutorial in the next few weeks! I live in an apartment building and I guess I better not try this! But I do not like my parquet floors, and I am looking for something easy to do that will get rid of that look. Very cool! We live in Oakland and have this funny little office with uneven floors. I wonder if it would help even them out? Where exactly did you find the product in the Bay Area or did you order it online? Thanks for the demo! The last time my husband went away I painted our upholstered beds with white house paint, and the results are great….don’t know if I would have had the nerve to do it with him witnessing the process! Good for you on taking the chance with the concrete, if it doesn’t quite hold up, at least you learned how much you love the concrete! A couple comments on wearing…we did our kitchen counters per the LGN diy in September. One of the first things I learned is that the sanding step is CRITICAL to getting the hardest finish possible. The stuff sands so easily (and with major dust!) that it was really hard to not go all the way through to the original surface. After three sections of counter I landed on the best technique – a couple light layers to level the substrate and make a foundation, followed by 3 heavier layers about 1/4″ thick. I allowed each of the last three to dry thoroughly then sanded til really smooth. You could see the areas getting harder and less porous before your eyes. We finished with three coats of a concrete sealer made for counters so it was safe for food prep. As for wear- the surfaces (especially the last one I did) have held up really well. Water or oil that is left for more than about 5 minutes will stain, but dry out over time. Other things (red wine, various food) when wiped up pretty promptly, leave a faint stain but it blends with the variations in the concrete color. The only real problem is the edges. I tried to really get a good amount on the square laminate sides and edges, but in a couple places where something banged against it, it chipped. It’s not hard to mic a little to patch but irritating non the less. Be prepared for a ton on dusty mess when sanding and wear a mask and glasses. Overall I would do it again, everyone loves how the counters look! I LOVE these. I’ve been tempted to try these for years and seeing these tempts me to no end! Thank you for sharing. PS, I’ve reading details now… and … oh, I do the same thing: every time my husband travels I have this extra strange energy and I re-construct the house. I’ve moved entire rooms, painted ceiling murals, torn down wall paper, etc while he’s been away. What is that?! …. I’ve never regretted what I’ve accomplished and love this, too! … now , to see if I can find any of these products in Sweden…. Thanks for sharing! We’ve been planning on doing just this in our new master bath! 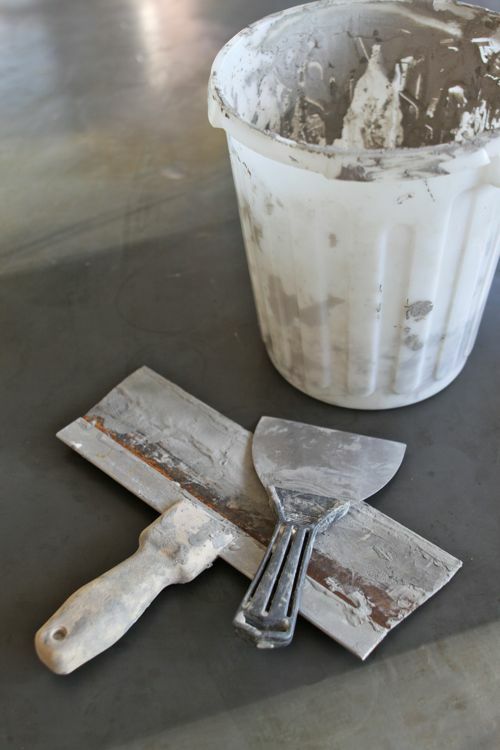 I’ve worked with a similar concrete product on our boys’ bathroom counter top, and loved it. We’ve also made our own concrete kitchen counter tops. I love them, too – but the faux-finish is so much easier. Very nice! Does it shrink as it dries and cures like thicker concrete? Will you use baseboards at the perimeter? Will you trim out the hatch opening? I like the idea of cool concrete here, because heat rises, and carpeting might be too uncomfortable in warmer months. You can always throw down a lambskin or other cuddly in the cooler months. wow, this is fantastic! i wonder if this stuff would work as a wall finish?? very awesome! Love it! I’d love concrete downstairs in the rumpus room, but it will be very $$. (At the moment we have super classy salmon tiles next to blue carpet (hmmm) It’s a high traffic area though, from the front door, leading to carpeted (completely different carpet) stairs. Wonder if u I could convince hubby to lay ply and do ur trick!! I love this! I’m thinking of doing this to our sunroom. Any pointers on where to find a tutorial showing how to lay down the burlap first? Thanks! I have a sunroom with this finish calling its name! Thank you! The concrete was a straightforward grey and the stain seemed to add both warm and cool tones. Not sure how it works, but it looks great! How is this holding up almost a year later? What was your subfloor? Would love to hear an update and any reflections you have a couple months after the fact. Have you noticed any wear yet? Is it easy to clean? No noticeable wear beyond the hairline cracks at the plywood seams. I’m still loving it! It’s so inexpensive, that for me, it’s one of those things that’s worth a try. If it doesn’t work, you can always lay carpet or tile or VCT over it. I’m thinking of doing this in a small space, but there’s a tiny bit of flex in the floor plywood flooring (3rd floor, older home)… Have you seen any cracking in your reading loft ? Yes. There are hairline cracks at the plywood seams. I don’t mind them. But I am told if you staple down a layer or burlap first, and then add the cement layers, that it will prevent those cracks. I haven’t tried it, but it might be worth a shot. I’m so curious to hear how well the loft floor is holding up. I have 2 children’s rooms that have had their carpet removed (for some time now) and absolutely need something in the mean time until we can afford our timber floorboards through out the whole house. Has it cracked? gotten dusty/chalky? I can’t stop thinking about this, please put me out of my misery. My husband says no it won’t work, but I don’t have a problem at all about proving him wrong lol. He and our son go away in a few weeks so Id love to get it done then when its just my daughter and I at home. Hi Nova. The floor is holding up wonderfully. No dust or chalkiness at all — the sealant prevents any of that. The only cracks are along the plywood seams, as I mentioned above. There are no other cracks at all (hooray!). This is not a space that gets tons and tons of traffic (like a hallway), but I’m impressed so far. Even with cracks on the seams, it’s definitely a big improvement over bare plywood. The cracks are hairlines, nothing major at all. And if you’re up for experimenting, you could certainly try to staple down a layer of burlap first and then add the concrete over that. Supposedly, that prevents cracks on the seams. Really loving this look! A great alternative flooring that will be extremely durable. Thanks for sharing your project, I will be definitely trying this on my new project. I am thinking of doing this in our half bath. I see other tutorials use several steps and water proof barriers such as felt paper, metal lath, crushed stone, sand, 6 mil sheet plastic for vapor barrier, insulation board etc. Yours seems WAY more simple! Do you think for a half bath on the main floor these other steps should be taken? It is used daily by our family and guests when they are here. Hi Jill! I would be very nervous to try this method in a bathroom that is used daily. I would definitely think using a water proof barrier was necessary. I am considering do this project in my main floor. I will be going over old hardwood flooring. I know that going over hardwood is not common. Most post are on installing hardwood over concrete not the other way. I love the look of concrete floors but can not install them due to weight and the height increase.How has it held up? I will take your advice and lay burlap down first to avoid cracking as much as possible. Will I need to follow the standard rule for expansion joints for concrete? I’m reading your email question from Perth Western Australia. I just love this tremendous opportunity we have in being able to layer concrete on floor boards. I’m in a similar situation as you had. I would very much like to know how you went particularly if there is any cracking. hi there! i’m thinking of doing an entire kitchen floor with this awesome DIY project. it’s my office kitchen – approx 15′ x 13′. what do you think? will it hold up well? also, it would be my first wild DIY project – do you think it’s too much for a beginner to take this on? and lastly, do you think it would work over very old kitchen tiles (cheap linoleum)? would appreciate your input! I was thinking about doing this over my kitchen/dinning room linoleum too. Did you try it? How did it work? I have a split level home so my kitchen is over my basement so I don’t want heavy concrete..that is why I’m so interested in this process. Amanda- Wondering if you ended up putting this over your linoleum and how it turned out. Could you tell me what color stain and brand you used as well as the sealant? this is awesome and you made it seem so easy! i might try this (for practice) in a walk-in closet first! i want my bedroom floor concrete!! thank you! That’s really pretty and a very good idea. I’ve seen the counter top redos, but never thought about flooring! I also love the idea of how easy to clean it would be… hmmmm!!! Would you recommend the stain/sealant you used if on were to do this on a kitchen floor? Would it hold up? have you tried it on another area yet? I am seriously considering ripping up the carpet in my girls’ room and doing this. The floor beneath the carpet is already concrete so I’d probably just have to remove the glue, sand it a bit, stain it hen put a clear coat on. It just seems so much easier to maintain and cheaper than any other surface! If you did it in your son’s room please show pictures and let me know how it turned out! I am planning to redo my concrete slabs kitchen flooring, but how can this possible by myself. I don’t have any idea about the maintenance things. Kitchen is most tough one to maintain. This is the place where staining sauces, juices, and condiments can splatter and spill in every direction and naturally ending up down on the flooring. So I am considering a professional polishing service from Floortex in Canada. I looking forward to get a more glossy and finished look on those concrete slabs. Hey! Thanks for this awesome post. I live in SF and wanted to get some of that feather finish concrete. Did you order it online? Or were you able to find it in the Bay Area? Please let me know! Have a good one. Can you give us an update on how this floor is doing? I am considering putting it in our guest bathroom. Thanks! Hey, I absolutely loved reading this! We live in the UK and I’m desperate to get some concrete flooring in our new home/project, but at the moment we can’t afford the pricetag. Perhaps your way of achieving the look is the answer! How do you think it would hold up in a bathroom? Perhaps I’d need to seal it to make it withstand water spilling on it? i have had the idea in my head for a while. i want to do my living room. the room is already concrete so i’m hoping i can clean it very good and stain it. i will also use an area rug afterwards. do you think this is a good idea? please help!!!!! Thank you so much for detailing your experience. I’d love to give this a try in my kitchen. Like you say if it didn’t hold up then it can be covered over! Also I wanted to add a suggestion for people wanting to try this. Oxide powders mixed into cement can add beautiful tones and depth. They come in a variety of colours. I love the effect you achieved with the stain I may be tempted to use both oxides and the stain if I do manage to do this myself. I haven’t quite brought myself to try this yet but am thinking of giving it a go this week on a smaller area (the toilet room floor) while hubby is away! If I do go ahead with it I’ll let you know how it goes. Am a bit nervous, may also use burlap I believe. All the way from the UK I’ve decided to give this a go in our bathroom! I also took to tip of using burlap cloth (also read somewhere else) – my advice to all is to invest in the cloth as it stops the Ardex from cracking and also seems to provide a softer touch to the foot once all the layers are down. I was wondering if any UK people had tracked down a suitable stain? I really like the look of the Masons Select but the cost is near £100! as the product is American. Can anyone suggest any similar solutions available and affordable in the UK? thanks for posting this. i’m wondering how those hairline cracks are doing and also if you know of anyone has tried this with the burlap and how it held up? I’m wondering how you think this would hold up in a wet area? I’m looking for a industrial solution for my bathroom floor and shower recess. Any advice would be greatly appreciated! hey, this is awesome, where can i find the burlap you speak of, seems like that really kinda ups the price and do you adhere the burlap to the surface or you just plop it on, is it possible to caulk or spackle the lines between the plywood? After some years does the floor still perfect (just some smaller cracks)? Does it happen that you have experience of larger and more busy areas also since then? Hey, I am wondering about you comment “low traffic area”. I would really love to apply this method to a kitchen floor , but, as its a “high traffic area” is it likely to crack a lot? Thanks for the post. I was wondering as well if this would be ok as a kitchen floor. With the burlap cloth stapled on top of the plywood and extra layers of the Ardex Feather Smooth, do you think it would hold up? Maybe a concrete sealant could be applied in the end. Wow! This is SO what I needed!! I’ll be inheriting my parent’s house shortly and I know I won’t be able to afford any “real” flooring. …but that’s cool, cuz I really like the concrete finish. I recently took an art class at someone’s home and his floors were concrete – – there were some cracks in the cement (which I am fully anticipating finding when I get the carpet up at my parent’s house), so he used extra-bright colors and wrote along the cracks things like “Warning: Elevation Change” and my favorite, “This is NOT my fault!” Ya work with what you’ve got, right? Hello, Thanks you so much for your post, it’s incredibly helpful. Would you explain how you applied the sealant? Hello, I want to thank you for the post, all my house is pure concrete and I was so undecided what to do. Where I’m from in Texas its usually windy and really hot year round so carpet is a big no, no for me. Anyways, I love what you did here and reallllyyyy love those imperfections most of all, that I’m going to give it a try on my master bedroom first then we’ll see from there. Again thank you so much for the post. I dont think the seams are noticeable at all- it looks awesome and much better than any other option in the price range… you have so much natural variation in the finish, how did you do this? ive used ardex feather finish on several projects in my house and the finished color is very uniform. I am curious how this has held up over time… I am looking at a complete basement reno and considering concrete for some of my floors. ALso: how long did 6 layers take you? would this work to cover the old cement floor of my garage. Im making it into an art studio, and the old cement floor is cracked and oil stained. I would love to do it in my hall bathroom, but it’s the children’s bathroom as well so high traffic and lots of water. I fear the durability. Have you spilled anything up there? Results? How has the floor held up 3ish years later? I am building a house and would love for the upstairs to be concrete floors like the downstairs! I second this I would like to know how it held up! 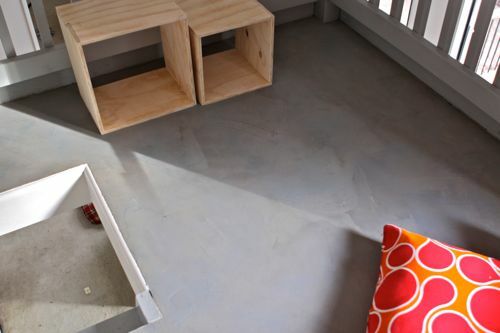 I love to try this DIY concrete floor to my son’s playroom. I think that it will gonna be perfect for it. Thanks for sharing this.